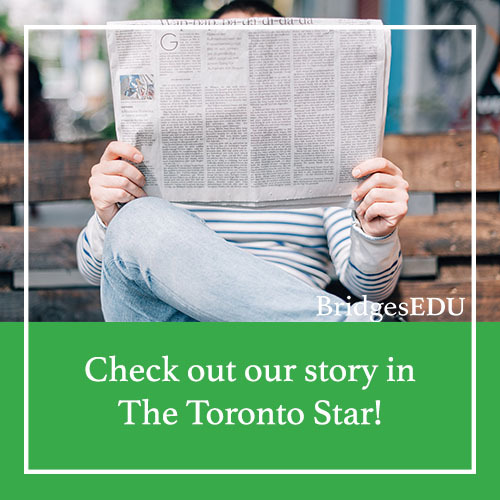 Recently, BridgesEDU was highlighted in a story on critical thinking and bridging the gap between high school and university in The Toronto Star. After working with us, students know how to confidently translate critical thinking skills into reading, writing, exam execution, and tutorial participation. Our program is unique and was developed by our founder, Christopher Grafos, Ph.D., after he saw too many of his students struggle unnecessarily with the expectations of professors. Chris sincerely believed that his students, and many others out there, had the potential to soar in their undergraduate programs if they better understood the expectations of university learning. He is now dedicated to helping students across Canada realize this potential. Join the many students who have figured out the methods to success in university! See the article in The Toronto Star by Brandie Weikle.